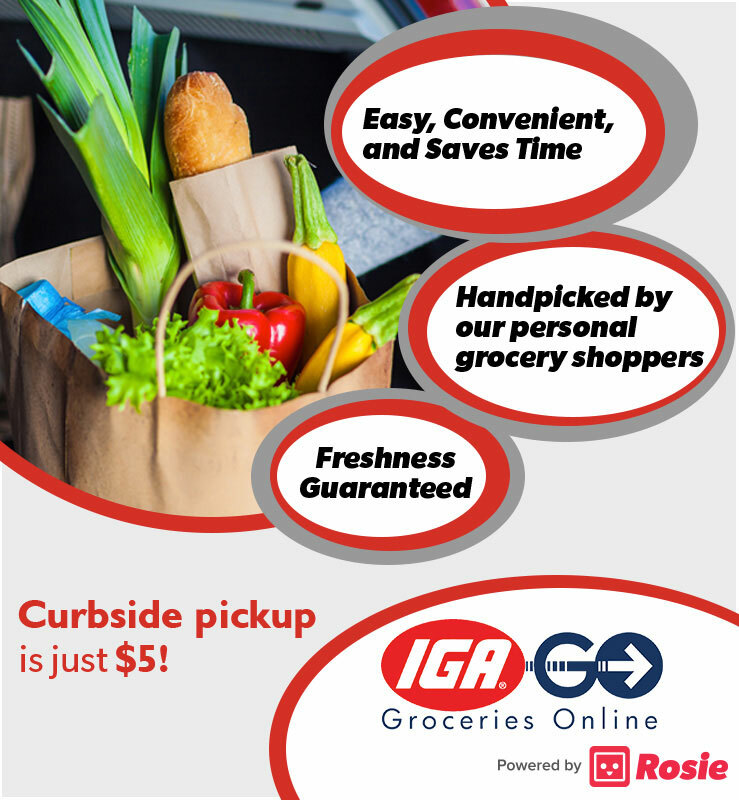 Shop online with IGA GO Powered by Rosie and have all the groceries you know and love from Okanogan Market IGA available for convenient curbside pickup! Each order is carefully hand-picked by our personal shoppers, and we offer a 100% happiness guarantee. Use your computer, tablet, or phone to shop from the comfort of your home or on the go, and pick them up at a convenient time of your choosing. Leave everything in the middle up to us! IGA GO is Powered by Rosie, our online shopping partner. To get started click here to create a free account on Rosie, then start shopping our complete inventory for all your favorite items. At checkout, choose from available days and times for convenient curbside pickup. You can also download the Rosie app right to your iOS or Android device! Curbside pickup is just $5 for orders less than $75, and free for orders above it. Pick whichever time between 10 AM and 7 PM, seven days a week, is most convenient for you to get your groceries and let the store know when you've arrived! Curbside pickup is just $5.00. At this time we are not offering delivery. What are the IGA GO hours? The IGA GO online grocery store is available to you 24/7 so you can shop and place your order whenever it is convenient for you. Our curbside pickup times are from 10 AM to 7 PM, seven days a week. Are there other IGA GO locations? IGA GO is available at Okanogan Market IGA in addition to the others on the complete IGA GO location list below. Note that pricing, hours, and delivery availability may differ from this IGA GO store.